Fiji is composed of 2 main islands (both much larger than even Tahiti), Viti-Levu to the SW and Vanua-Levu to the NE, along with a swarm of smaller islands scattered around (See Amanda's map). 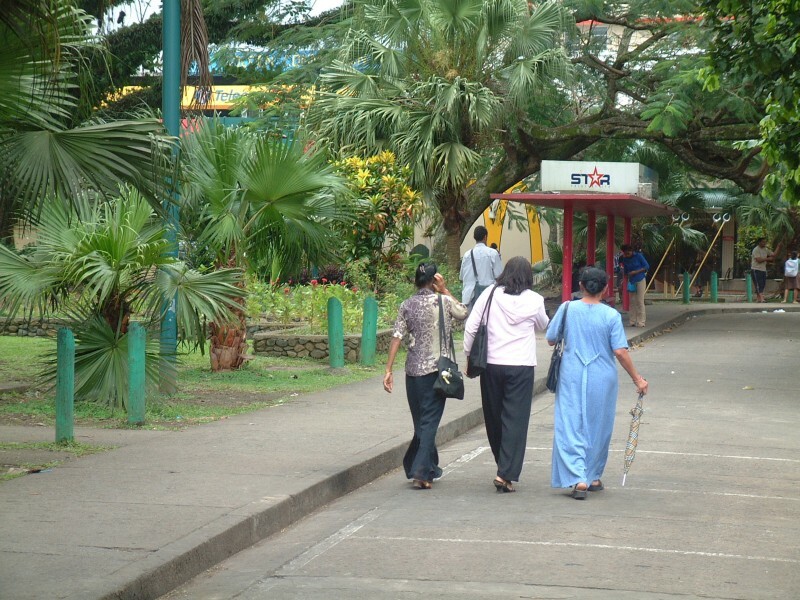 Suva, the "big city" on the south side of Viti-Levu, was a pleasant surprise. We're usually not much into cities, but we haven't been in one since Tahiti in February. There are book-, clothing-, and boat-stores to peruse, interesting foods to buy, dentists to replace Jon's crown that fell out, a large and colorful local market, and dozens of cheap and tasty restaurants to enjoy. Our downfall was the Republic of Cappuccino, where we could buy delicious tropical fruit smoothies and satisfy caffeine cravings with iced-mocha's as thick as milk-shakes. The yacht-club is very friendly, and the Fiji Bitter is a passable brew (and cheaper than Tonga's aptly named Ik-ale). 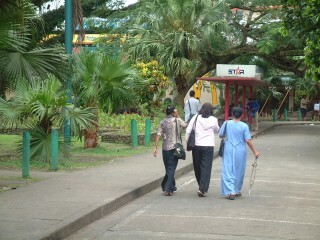 Sunday October 17th we finally finished enough of our chores to escape Suva. At 5:30am we pried the anchor from the mud of the harbor and headed for the gap in the reef. 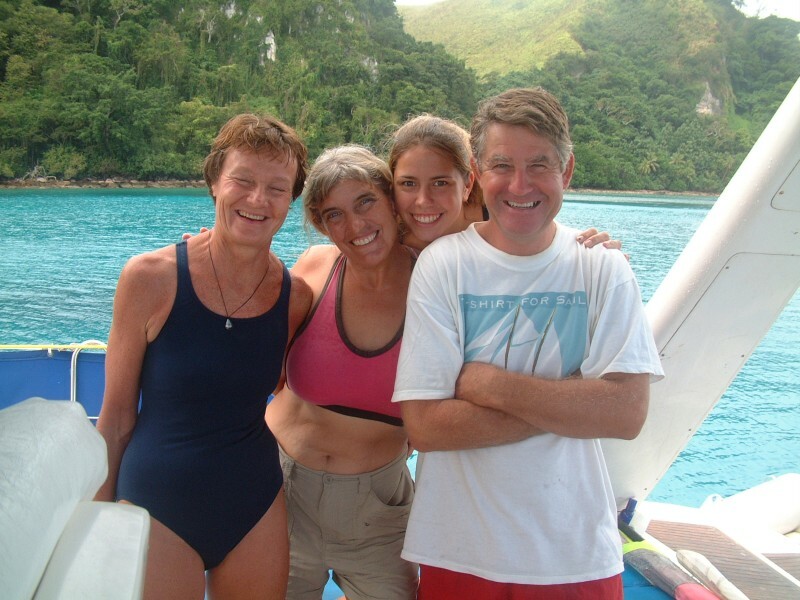 Our friends Peter & Connie on Cookie Cutter had been waiting for us for several days at a small island east of Viti-Levu, about 70 miles away, a long day-sail for us. Unfortunately, Makongai also has an unmarked and narrow reef entrance, requiring good light to enter. After motor-sailing east for about 3 hours, we were finally able to bear off NE enough to have a rollicking good sail up the east side of Viti-Levu. The reefs extend far from land, and it was strange to be sailing along the edge of the reef but have no "land" anywhere near us. We couldn't even see the reefs very well, as the higher tides here mean they generally don't stick up as much as the reefs in French Polynesia. Luckily, our electronic charts continued to be spot-on accurate (this won't last), bringing us to the Makongai pass a bit before 4pm and we were safely at anchor about 30 min later, having drinks and dinner and catching up with Cookie Cutter. 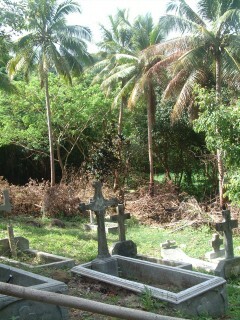 The cemetery of the old leper colony is still maintained, and the encroaching forest kept at bay. 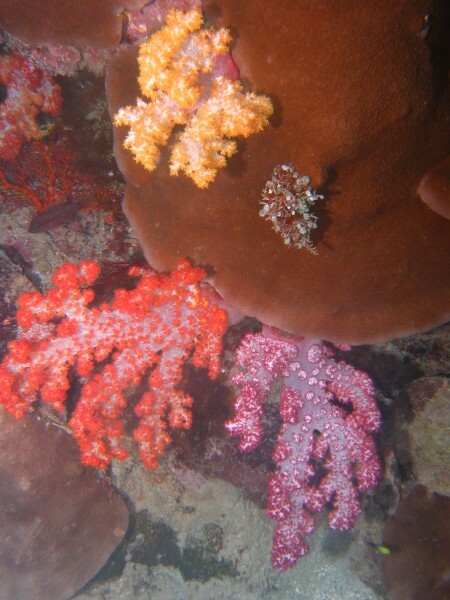 Fiji is famous for its brilliantly colorful soft corals! So we were looking forward to our first snorkeling in Fiji. The Makongai beach doesn't look like much, but the coral just offshore is wonderful. Vibrantly alive (much more so than Tonga) with lots of reef fish. 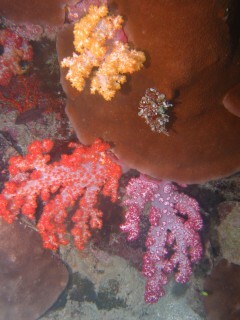 The hard corals are mostly browns and tans, but when the sun comes out we can see greens, oranges, pinks, and yellows. These are mostly in pastel shades, but there are some brighter maroons, purples, and the electric blue tips on some corals that denote healthy growth. All around are delightfully colorful reef fish, including several species that we haven't seen before. But the real treat was deeper down. Under the spreading fans of hard corals were lots of soft corals hanging down, and these had much brighter colors than the hard corals - vibrant reds and golds and oranges. Since we weren't able to do any snorkeling before we left Tonga or in Suva harbor, we've been making up for lost time by snorkeling several times off Makongai. From here we plan to cruise along the reef-encrusted north coast of Viti-Levu probably in company with Cookie Cutter. At the western end, we'll have to decide if we're going to stay in Fiji for the cyclone season or sail the 1,200 miles (each way) to NZ and back instead.